The Pre-Professional Phase provides students with the strong basic science foundation and basic Athletic Training knowledge and skills during their first two years in the program. Completion of this coursework provides students with the knowledge and skills required to be successful during the Professional Phase along with a well-rounded liberal arts framework from which to pursue the remainder of their professional development. 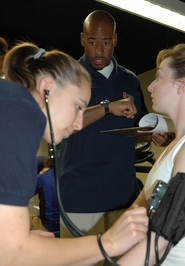 Throughout the Pre-Professional phase, students have opportunities to become professionally active through DUSAT (Duquesne University Students in Athletic Training) and to learn more about the profession of Athletic Training through our mentoring program. To further protect the health and well-being of students and their patients, all students are required to have a complete physical exam and demonstrate appropriate immunizations before beginning the first professional Athletic Training course during the sophomore year (ATHT 201).